Molech, whose name probably derived from Melech “king” and Bosheth, “shame”, was one of the deities worshipped by the idolatrous Israelites. He was referred to as “the abomination of the children of Ammon” (1 Kings 11:7) and the primary means of worshiping him appears to be child sacrifice or “to pass through the fire.” Solomon was said to have built a temple to him. Sacrificing children was not uncommon, but the practice died down around the time of Jeremiah when the King defiled Tophet, the place where Moloch was worshiped. Moloch has often been identified with Milcom, the god of the Ammonites. He was probably also identified with Baal, and as a sun or fire god, as he was also identified with the Assyrian/Babylonian “Malik”, and at Palmyra “Malach-bel”. Moloch is also identified with Baal Hammon in Carthaginianreligion. Moloch was the god of the Ammonites, portrayed as a bronze statue with a calf’s head adorned with a royal crown and seated on a throne. His arms were extended to receive the child victims sacrificed to him. 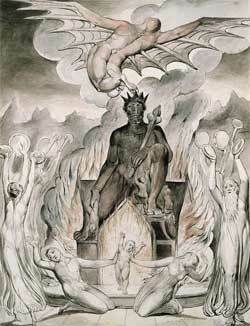 Milton wrote that Moloch was a frightening and terrible demon covered with mothers’ tears and children’s blood. Rabbis claim that in the famous statue of Moloch, there were seven kinds of cabinets. The first was for flour, the second for turtle doves, the third for an ewe, the fourth for a ram, the fifth for a calf, the sixth for a beef, and the seventh for a child. It is because of this, Moloch is associated with Mithras and his seven mysterious gates with seven chambers. When a child was sacrificed to Moloch, a fire was lit inside the statue. The priests would then beat loudly on drums and other objects so that the cries would not be heard.